You are here: Home / Parenting / Do You And Your Children Know The Juul E-Cigarette Health Facts? 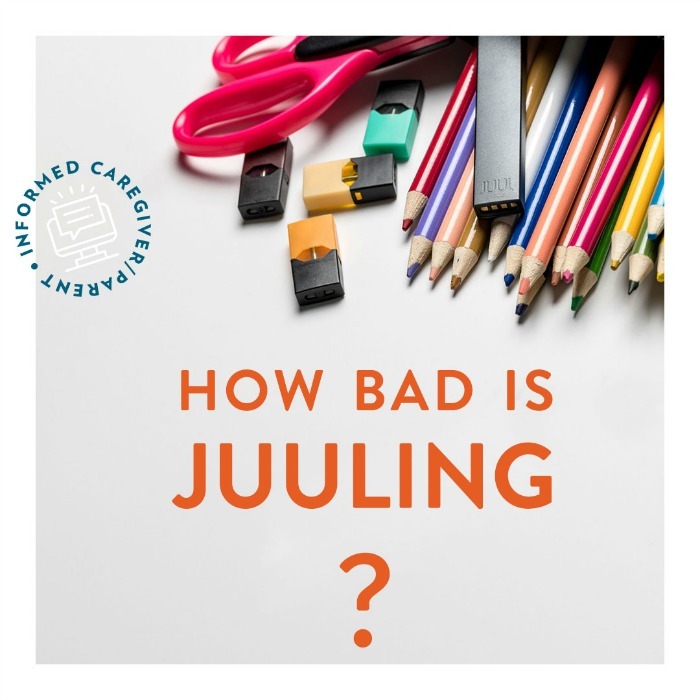 Do You And Your Children Know The Juul E-Cigarette Health Facts? Most people know cigarettes are bad for you. But many wonder how safe are e-cigarettes? The short answer is, e-cigarettes still pose health concerns and as a parent, that is something I want to get the word out about. A report from the Surgeon General says that, “E-cigarette use among U.S. youth and young adults is now a major public health concern… These products are now the most commonly used form of tobacco among youth in the United States… Most e-cigarettes contain nicotine, which can cause addiction and can harm the developing adolescent brain…The effects include addiction, priming for use of other addictive substances, reduced impulse control, deficits in attention and cognition, and mood disorders.” I have partnered with ConsumerSafety.org to share Juul e-cigarette health facts and a handy JUUL health effects infographic to illustrate the dangers of e-cigarettes in a quick easy to communicate visual way. Juul e-cigarettes have risen in popularity among today’s youth and studies have shown that many younger Juul users are unaware of the health risks, such as nicotine addiction, that they face with each inhale. While Juul e-cigarettes have been advertised as a cheaper and safer alternative to traditional tobacco cigarettes, many people have filed lawsuits against JUUL claiming that the products cause health problems such as nicotine addiction and injuries from device malfunctions. It is my mission today to share some Juul E-Cigarette Health Facts so that the youth will not go blindly into a habit that is bad for them. two packs of traditional cigarettes. traditional cigarettes contain. This plays a major role in their addictiveness. Above is a JUUL health effects infographic. As a parent, it is so important to help answer the question, are e cigarettes safe? I hope you will share this infographic socially to share the message that vaping does in fact present a health hazard. Do you have any personal takeaways, advice, and insights on the use of e-cigarettes that you’d like to share? Were you wondering how safe are e-cigarettes? Were you surprised at the answer? Well i will not allow my kids to use any kind of Cigarette. useful or not i will not allow.